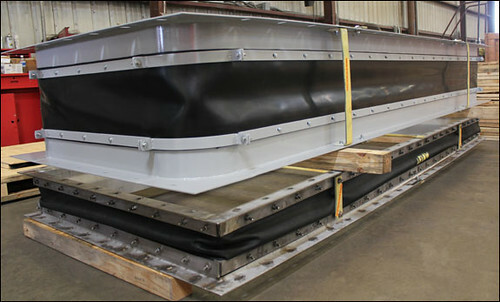 U.S. Bellows designed a 20′ x 13′ rectangular fabric expansion joint for a plant in Louisiana. This unit was custom designed to improve the current design by eliminating the need for insulation. The fabric belt consists of five layers and the frame is fabricated from 321 stainless steel. 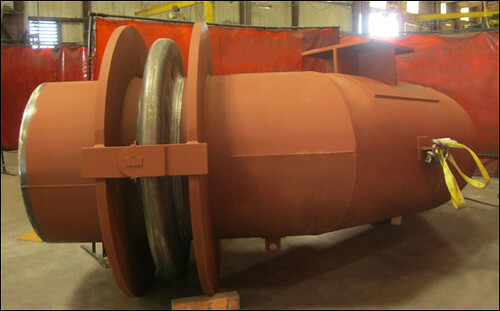 The expansion joint is designed for 1-7/8″ lateral movement at 1350°F and ± 10 psig and was dye penetrant tested prior to shipment. Splicing of fabric expansion joints is a critical operation which needs to be performed correctly for the expansion joint splice to hold up under system operating conditions. ensureAsplice is the answer to assure that a splice is made correctly. U.S. Bellows material is a thin, flexible, lightweight, PTFE material that clearly indicates when the proper conditions have been established for achieving a successful test splice on FLEXXCEL Fabric Expansion Joint materials. The U.S. Bellows material accomplishes this in two ways. First, a dramatic color change in the product during the splicing procedure ensures that the critical sealing temperature has been reached in the splice area. In addition, the material bonds to the expansion joint’s PTFE surface, confirming that sufficient pressure was applied during the splicing operation. The sealing process requires that all splice components be assembled between the heat sealer and the product. As the splice heats up, the U.S. Bellows product changes from a light shade of red to a much darker shade of the red. The easily observed color change can only take place after the splice components have reached the critical sealing temperature required for PTFE products. If sufficient pressure has been applied as the color change occurs, the product will adhere to the expansion joint’s PTFE surface, confirming that the proper splicing conditions were achieved. A successfully completed test splice utilizing the ensureAsplice material will ensure that the variables that exist during a field splice have been accounted for. The actual splice on the expansion joint can now be completed with confidence. 2. Begin by placing the product on the “Backer Board” surface. 3. Overlap the 2 pieces of FLEXXCEL belt material. The overlap should be the same width as the PFA Film. Make sure the PFA film is residing between the two belt ends in the overlap splice area. Staple the PFA Film in place. 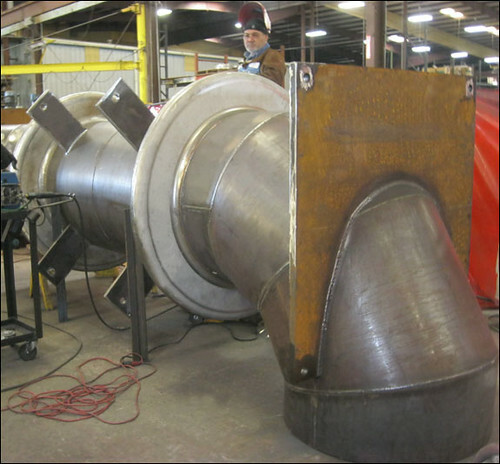 When doing a single ply splice on fabric expansion joint FLEXXCEL material, U.S. Bellows recommends that a test splice be performed first . Experience has shown fluoropolymers can be processed and used at elevated temperatures without hazard if proper ventilation is used. Make certain all heat sealing is performed in well ventilated areas. Make certain the heat sealer is safely handled during use. The heat sealer temperature will reach 725°F in normal operation. Special care must be taken with the heat sealer during handling due to the high temperature. 1. Plug the unit into an electrical outlet. 3. Backer Board or another insulated surface. 4. Push the toggle switch up to the “on” position. 5. Set the temperature by turning the dial to the desired temperature. A temperature range of 700°-740°F (370-385°C) is typical for splicing FLEXXCEL materials. The unit contains two lights, a “heat up” light and a “ready” light. The “heat up” light will remain lit until the unit reaches the set temperature, at which point the “ready” light will go on. 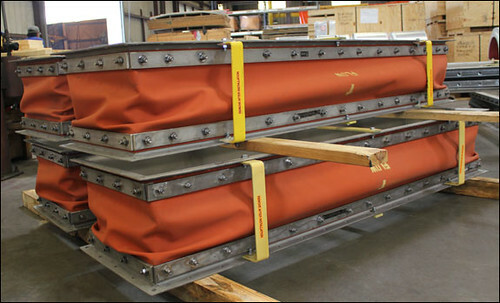 U.S. Bellows manufactures high-performance fabric expansion joints for industrial applications. 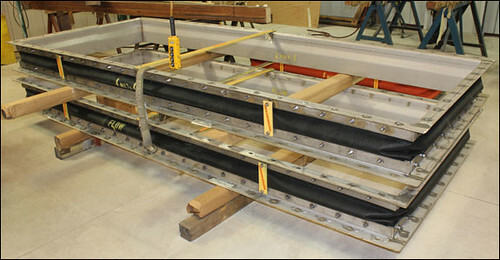 These expansion joints often require thermal-welding (heat seal splice) in field service. Cost effective and easy-to-use heat seal irons are available from U.S. Bellows for use with FLEXXCEL materials. The main function of a heat seal iron is to introduce enough heat to allow a proper bond between PTFE surfaces of FLEXXCEL materials. The melting point of PTFE is around 621Â°F (327Â°C). However, the setting of a heat seal iron is determined by factors like ambient temperature, thickness of bonding materials, and the surface upon which you heat seal. Applying pressure can help facilitate a good bond, but in order to achieve a correct bond, the melting point of the U.S. Bellows FLEXXCEL materials must be achieved.